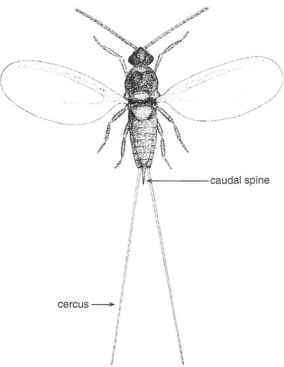 This psyllid is widely distributed in central and northern Europe, where it is a local and usually minor pest of carrot. Heavy infestations cause distortion of the foliage. The insect is also associated with other umbelliferous plants, including Anthriscus sylvestris, Heradeum sphondylium and Pastinaca sativa. In the British Isles, carrot sucker is restricted mainly to wild hosts in southern England and is of no pest status. Adults overwinter in the shelter of spruce trees and other conifers. In the spring, they migrate to umbelliferous hosts where eggs are eventually laid. The eggs hatch about 10 days later. Nymphs feed on the leaves during the summer and pass through five instars before attaining the adult stage, usually in September. There is just one generation annually. Adult 3 mm long, mainly green or yellowish-green, the body of older individuals is sometimes marked with pale brown; antennae black-tipped; forewings 2.0-2.4 mm long, hyaline.